A new chalk board mural wall in our Iowa City studio's front lobby. Our Iowa City studio recently got a major face lift. 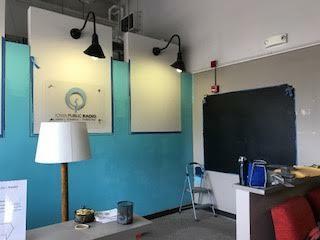 We painted some grey-brown walls robin’s egg blue, got rid of some office furniture that hadn’t been used in years and set up lobby space that reminds us of our living rooms at home. As a statewide network, we have studios across Iowa. Talk of Iowa and River to River’s production team is based in Iowa City, and for two hours a day on weekdays, the producers and hosts who work on those shows foster conversation that inspires and educates Iowans. When we set out on a quest to make our studios more inviting, we wanted our space to match that mission. As we grow as an organization, we're also looking for new ways to meet Iowans. Cue a half gallon of chalk board paint, an artist from Monticello named Casey Reyner, and a belt sander. Reyner desings and draws a chalk mural at a bar and restaurant called The Jitney every few months and has been doing so for three years. 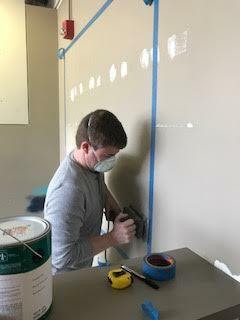 He’s also been involved in helping to design and create a chalk board mural wall in IPR’s Iowa City space. With the new mural wall, we want to invite artists to visit our studios and create and inspire. We hope to feature a new mural every few months, and we will be profiling the artists who participate on our website and on our Instagram, Facebook and Twitter pages. If you're an artist interested in designing a chalk mural, or visiting us to play an original song or two, contact Lindsey Moon at lmoon@iowapublicradio.org. Found Painting at Hoyt Sherman Has Been in a Storage Bin for 95 Years. Hoyt Sherman Place in Des Moines is adding to its art collection a piece from circa 1600 that it has owned for nearly a century without knowing it. Officials have discovered “Apollo and Venus” by Dutch master Otto Van Veen.